A U.S. Navy submarine and a Navy amphibious ship that collided Friday in the Strait of Hormuz south of Iran have arrived in Bahrain to be assessed for damage, the Navy said. The submarine USS Hartford and amphibious ship USS New Orleans arrived Saturday in Mina Salman pier to “to further assess and evaluate the damage that resulted from their collision at sea,” the service said in a written statement. Fifteen sailors were slightly hurt aboard the Hartford in the collision, which occurred early Friday morning. On Friday, Navy officials in Washington told CNN that there was significant damage to the sail, or tower-like structure on the topside of the submarine. 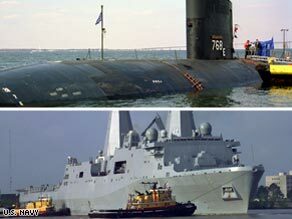 On Saturday, the Navy said there was no damage to the submarine’s propulsion unit. No injuries were reported aboard the New Orleans. The ship’s fuel tank ruptured, spilling 25,000 gallons of marine diesel fuel in the Strait of Hormuz, the U.S. Navy said in the Saturday statement. “Aerial searches of the area where the fuel spill occurred were conducted yesterday, and revealed no indication of any remaining fuel on the ocean’s surface,” the Navy said. “The quick dissipation of the fuel is likely due to the type of fuel, and various environmental factors to include air and water temperatures, winds and seas.” When the collision occurred, both vessels were headed to ports in the Persian Gulf to stock up on provisions and allow for some recreation, Navy spokesman Lt. Nate Christensen said Friday. Christensen said there were about 200 sailors in the sub and 1,000 sailors and Marines aboard the ship. The Strait of Hormuz is located between the United Arab Emirates and Iran, linking the Gulf of Oman and the Persian Gulf. It is heavily used by oil tankers. Both vessels are on regularly scheduled deployments to the U.S. Navy Central Command area of responsibility, and conduct Maritime Security Operations.